Our best-rated VPN vendor NordVPN has just released a brand new app for Android TVs. NordVPN has been supporting many platforms from Windows and macOS (including browser extensions) to Android and iOS. But app dedicated to Android TVs was missing until now and we are super happy to try it out. Using a VPN solution on your smart Android TV is just as important as on your smartphone. However, the use cases are slightly different. For example, you are not logging into your online banking account or sending e-mails. But you can still make in-app purchases. Security – Even though you are not logging into your bank account, you still logging to services like Netflix or YouTube. And unless you have a VPN on your router, the login information may be easily stolen by a hacker. Some TV apps also collect your credit card information during in-app purchases. Unblocking geo-restricted content – Some of the TV apps offers a different content based on your location. 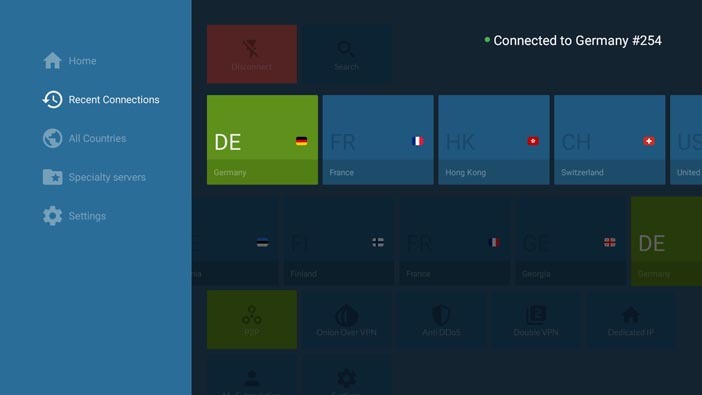 To unlock the full potential you can select any of the 62 countries NordVPN offers. Smooth streaming – Some ISPs are intentionally lowering down the connection speed for streaming services. With NordVPN installed you can enjoy smooth streaming as no one will tell on what exactly you are using your Internet connection. Quick Connect – Connects to the closest and fastest VPN server with a single click. CyberSec – Blocks malware-infected websites and annoying ads when browsing. Tough Encryption – Encrypts traffic using an OpenVPN protocol with AES-256-CBC encryption. TCP Ports – Allows you to switch between TCP and UDP protocols. If you don’t have a NordVPN subscription yet, you can get it below from $3.29 per month thanks to our special deal.